Why Springfield? – high-end dental and facial cosmetic treatments at affordable prices. The Springfield Dental brand is synonymous with high-end dental and non-surgical facial cosmetic treatments at surprisingly affordable prices, and our well-earned reputation makes us the first choice for individuals pursuing a beautiful natural-looking smile and a more youthful, healthy appearance. Our principal dentists Dr Karen Quail (GDC reg no 73595) and Dr Stuart Randell (GDC reg no 72355) invest in the very best equipment and are dedicated to keeping abreast of the changes in modern dentistry by continuing their dental education. Springfield Dental is more than just a dental practice: enjoy the opportunity to look and feel fabulous by taking advantage of the outstanding skills and breadth of affordable treatments under one roof. We are a small team providing an intimate service. You will find us friendly, approachable and unabashedly proud of our skills. Quality doesn’t have to be expensive; our extensive additional training means we provide affordable treatments that rival the best in London. We are by choice a non-NHS practice, with the exception of a children’s NHS contract. We adhere to a strict code of practice as stipulated by the British Dental Association in regards to patient care, radiation, cross infection control and sterilisation. 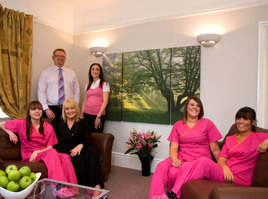 Our dentists also adhere to the GDC’s standards of dental care. Great location, great staff, great experience.. Thanks for giving me a beautiful smile and my confidence back.